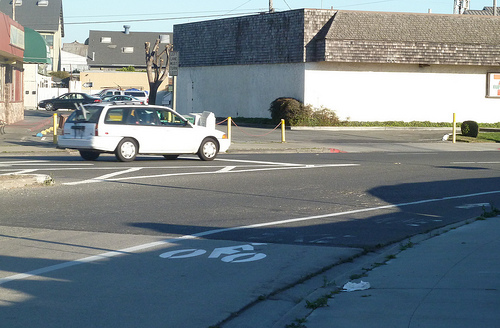 The East Bay Bicycle Coalition is campaigning for street improvements on Park Boulevard, including the addition of bike lanes and possibly a reduction in car lanes. I wholeheartedly support this effort. 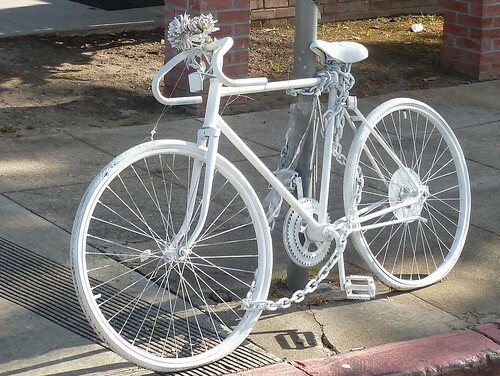 In the first month of this blog’s existence, I wrote a post about why Park Blvd is such an awful street for a densely populated neighborhood (oddly, I did not advocate for bike lanes in that post, even though I get almost everywhere by bike). There have been minor improvements to the street since I wrote that in January of 2009, including new traffic signals and sidewalk bulbouts at the intersection with Newton and East 20th, allowing people to cross over to FM Smith Park with less risk of bodily harm. The main problem, however—a road which feels more like a freeway than a city street—remains. With the Parkway Theater still sitting dormant after closing four years ago, Park Boulevard needs all the help it can get, and some local merchants seem to appreciate the benefit to the community that a more livable street could bring. For those who live farther afield, relatively flat Park Boulevard would be an ideal bicycle route for many commuters, but in its current form it does not feel like a safe space for cyclists or pedestrians. Changes to street designs are almost invariably fought by some neighbors, who fear slower traffic or fewer parking spots (or who are just wary of change in general), so advocates for safer, more ped- and bike-friendly streets need to make their case clearly, loudly, and repeatedly. Nearby Lakeshore Blvd has been dramatically improved by cutting the number of full-size lanes from 4 to 2 and adding bike lanes on either side. A road diet and bike lanes on Park Boulevard would be an improvement as well, making the road safer not only for cyclists and pedestrians, but for drivers as well (see above photos). You can find out more about the Bike Coalition’s Park Blvd campaign here at their website, and take a short survey to give your input about how Park might be improved. When word came in October that the Alameda County Sheriff, Gregory Ahern, planned to purchase a surveillance drone—or, in the antiseptic language of bureaucratic juggernauts, an “Unmanned Aerial System”—with little public scrutiny or discussion, the negative reaction was swift from privacy watchdogs such as the ACLU of Northern California, the Electonic Frontier Foundation, and Alameda County Against Drones, an ad hoc group of local residents and activists. Perhaps surprised by the wide attention his plan attracted, the Sheriff took pains to reassure people that the use of drones would be limited. “We would use it for specific events, not to patrol the unincorporated areas of the county looking for whatever,” said a spokesman for the Sheriff’s Office. The Sheriff acknowledged that inexpensive aerial surveillance capabilities raised concerns about how widely such capabilities would be used, and stated repeatedly that a clear policy would be crafted in order to prevent the abuse of the new technology, telling reporters that it would be for truly emergency situations only. “If we get one, obviously a policy has to be written up on when we’re going to use it and those types of things,” the spokesman told the Contra Costa Times. 7. Funding in the amount of $31 ,646 will be allocated to the Alameda County Sheriffs Office to purchase an Unmanned Aerial System (UAS), weighing less than 4lbs, equipped with live video downlink. The Unmanned Aerial System consists of an unmanned aircraft, the control system, a control link and other related support equipment. Unmanned Aerial Systems save money, enhance safety, save lives and can be utilized across a myriad of public safety disciplines to include the Homeland Security Arena. This system will provide real-time situational analysis for first responders to include search and rescue missions, tactical operations, disaster response, recovery and damage assessment, explosive ordnance response, wild land and structure fire response and response to Hazmat incidents. The UAS can enhance the safety of first responders and citizens alike and will enhance our ability to respond. The Sheriff’s Office will operate the UAS in full compliance with the mandates of the US Constitution, federal, state, and local laws, and will seek a Certificate of Authorization from the Federal Aviation Administration. That is the entirety of the discussion in the document. Aside from the pro forma sentence claiming that the drone’s operation will comply with all laws and FAA requirements (and even the US Constitution—fancy that! ), there is hardly a nod toward concerns about privacy or civil liberties, or mention of any plan to enact a policy limiting the drone’s use. The long list of possible uses in the document (“search and rescue missions, tactical operations, disaster response, recovery and damage assessment, explosive ordnance response, wild land and structure fire response and response to Hazmat incidents”) suggest that the Sheriff foresees using the drone in a wide array of circumstances, which is already troubling enough without clear guidelines. To make matters worse, however, other documents (pdf) obtained by the ACLU belie the department’s claims that the drone would only be used in limited “emergency” situations such as disaster response or Hazmat incidents. In a grant application for drone funding from the California Emergency Management Association, the Sheriff defined the drone’s purpose as “Intelligence and Information Sharing” and certified that it would be used for “Law Enforcement Terrorism Prevention-oriented activities.” With everyone from Greenpeace to PETA to Quaker peace activists being ensnared in “terrorism” investigations in post-9/11 America, it’s not hard to imagine that a local sheriff might abuse the term to justify surveillance of any number of nonviolent dissidents, activist groups, or other innocent people deemed “suspicious” by the Sheriff’s Office. The Sheriff’s public statements in the media suggest an awareness that citizens may be legitimately concerned about having near-invisible surveillance drones equipped with a “video downlink” flying overhead without our consent, but the effort to push through the purchase of a drone before a full discussion of the topic among civilian leaders and the public, and before establishing a clear set of policies guiding a drone’s use, should be a bright red flag even for citizens who believe that surveillance drones are an inevitability that we will eventually need to get used to. One sometimes hears the argument that drones will just duplicate the capabilities of helicopters, at less cost and with less risk, so we should embrace them for budgetary and safety reasons. However, any law enforcement tool which makes surveillance dramatically cheaper and easier also dramatically increases the potential for abuse, because there is suddenly much less cost (in dollar, manpower, and officer safety) associated with excessive or improper use of the tool. Welcoming drones because they are “equivalent” to helicopter surveillance is like welcoming law enforcement use of secret GPS trackers on all of our private vehicles because they are “equivalent” to assigning officers in cars to follow us around all day acquiring the same information. Drones (like GPS trackers secretly placed on cars) are so inexpensive compared with the old-tech alternative that they deserve to be recognized as a qualitative shift in law enforcement surveillance capability, with a full public discussion and oversight, rather than merely as an incremental quantitative change in police power. Since security contracting is big business, it probably won’t surprise anyone to hear that there is now a strong drone lobby, and indeed even a proudly bipartisan “Unmanned Systems Caucus” in the House of Representatives whose mission is to “educate “members of Congress and the public on the strategic, tactical, and scientific value of unmanned systems” and “actively support further development and acquisition of more systems.” (Not to be outdone, several Senators recently started a separate drone caucus of their own.) Naturally, those elected officials have been hard at work sucking up millions of dollars in drone-related campaign contributions as they work to expand the use of drones by both law enforcement and private corporations. The use of drones for domestic law enforcement and “homeland security” purposes is still in its early stages, but is ramping up rapidly, with unknowable ramifications for privacy and the fourth amendment guarantee against unreasonable searches. Drones are, quite literally, flying in uncharted legal and political airspace, and residents of Alameda County have an important opportunity to set a nationwide example by forcing political leaders to impose oversight by considering the full implications for the privacy and safety of Alameda County residents, and setting out clear policies and parameters, before allowing the Sheriff to acquire a drone. Alameda County Against Drones has come up with draft legislation for a moratorium on the purchase and use of unmanned aerial vehicles in Alameda County, and the legislation also includes a compelling list (footnoted, even!) of risks and known abuses associated with drones and other aerial surveillance. The full column (sans photo, I’m sad to say) can be read at Governing’s website. The following is a short history of Oakland’s Miller Avenue Library written in 1996, excerpted from the registration form for the National Register of Historic Places (available in PDF form at the National Park Service website). The vacant, city-owned building is currently the site of the Biblioteca Popular Victor Martinez, or the People’s Library, where activists and neighborhood residents are operating an open-air volunteer library and community garden. The Oakland Free Library 23rd Avenue Branch (later Ina Coolbrith Branch, now commonly called Miller Avenue Library), a Carnegie Library, meets the requirements for National Register nomination as set forth in the Multiple Property nomination entitled “Carnegie Library development in California and the Architecture it Produced, 1899-1921.” It was one of four architecturally similar but varied branches built under a 1914 grant to the city of Oakland, in four different North and East Oakland neighborhoods, designed by Oakland architects of statewide prominence. It served as a library from its construction to the late 1970s. Physically it is slightly but not greatly changed inside and out. Oakland pioneered branch libraries in California, opening branch reading rooms as early as 1878 and continuing to emphasize neighborhood branches as the city expanded. The 23rd Avenue branch traces its history to a reading room established in 1890 in what was then the easternmost part of Oakland, under the auspices of the Library Board with assistance from the 23rd Avenue Improvement Club. It occupied a succession of rented locations on the busy 23rd Avenue commercial strip (back to back with the present location). The present building was the second of the four libraries constructed with the 1914 Carnegie grant obtained by City Librarian Charles Greene for new branch library buildings. Greene’s project was suited to the Carnegie philosophy at the time; since 1899 when Oakland’s downtown Main Library had been funded, Carnegie’s focus had shifted to small towns and, in metropolitan areas, branches, to bring books closer to the people. Oakland applied for and received a grant of $140,000 for four new libraries. The $35,000 per branch was apparently a typical amount for a medium-large city. The four new libraries were to replace four of Oakland’s ten existing branches. The sites ultimately selected were Golden Gate and Alden in North Oakland, and Melrose and 23rd Avenue in East Oakland. Oakland’s match was to provide sites for the buildings, and 10% of the grant amount per year to maintain the buildings and their operations. Site selection for the 23rd Avenue branch seems to have been the most problematic of the four. The library board originally looked for a site to replace the existing East Oakland branch at 9th Avenue and East 14th Street in the old, fully built up Clinton neighborhood. This stirred protests against a location in the East 14th Street commercial area, and demands that the branch be located in one of the newer lakeshore residential areas farther north. 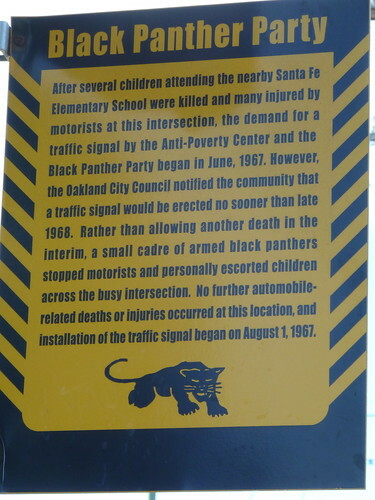 After almost two years, the board gave up on finding an acceptable site in the service area of the old East Oakland branch, and accepted the donation of a site to replace the next branch south, 23rd Avenue, in what is now called the San Antonio neighborhood. The site was donated by Henry Root, also co-donor with County Supervisor J.R. Talcott of the Melrose Branch site. Root was a railroad man and large local landowner with an interest in enhancing the amenities of the district. The donation was conditioned on the city’s extending a street in front of the library, thereby assisting Root in subdividing a very large block. The new street was originally called Foothill Boulevard, an extension of the scenic boulevard developed by Talcott through his Fruitvale neighborhood holdings parallel to East 14th Street. In August 1925 the street name was changed to Miller Avenue: reportedly “for a veteran of World War I,” notwithstanding the coincidence with the name of Grant Miller, county coroner whose mortuary business also fronted on the new street. Building permit #46090 was issued for the 23rd Avenue branch on July 20, 1917, for a brick and concrete library building, with an estimated construction cost of $31,000. The plans credit John J. Donovan, architect for the City of Oakland, and C.W. Dickey, associate architect. Contractor was Nielsen & Bertelsen. Reportedly escalating construction costs resulted in some of the funds for the Alden and Golden Gate branches, not yet begun, being diverted to the elaborate Spanish Colonial 23rd Avenue branch. C.W. Dickey and John J. Donovan are the architects for three libraries which remain to be built. The branch to be next constructed [23rd Avenue] will be of Spanish architecture with warm colored stucco walls over brick and a variegated Cordova roof. The Alden branch library… will be of modern English design with walls of dark red brick. The Golden Gate branch library… will be of Colonial design with red brick walls with white trimmings. While the external appearance of the three buildings will be totally different, they will have the same interior requirements and fittings. Each library will be two stories in height, the main entrance being halfway between the two stories, with broad stairs leading up into the central delivery room, and other stairs leading to the ground floor. The delivery desk is to be so placed that the librarian in charge will have complete command of the two reading rooms flanking the delivery room and of the main entrance. The reading rooms will each be about thirty-two by forty-one feet, lined with book shelves capable of accommodating 15,000 volumes, besides magazines and newspapers. The rooms will be lighted from three sides in the daytime and by semi-direct electric fixtures at night. The openings from the reading rooms to the delivery room will be so large that the three rooms will architecturally count as one. Back of the delivery room will be the librarian’s private office and the book bindery with a private staircase leading to the lower floor. On the ground floor will be located an assembly room about thirty by forty feet, capable of seating about 250 persons and fitted with a stage and electric connections for a moving picture machine. On this floor there will also be a study room sixteen by thirty-one feet, a staff room with a kitchenette, a furnace room, men’s and women’s toilets and a large shipping and receiving room with a fumigating closet and book lift to take books to the second floor. Each of the buildings will cost $35,000: the construction, finish, heating and ventilation will be modern and first class in every respect. Architects Charles Dickey and John Donovan were associated on three Oakland Carnegie libraries in 1917, and designed Oakland schools in the 1910s and 20s. Charles Dickey (1871-1942) was born in Alameda and studied architecture at MIT. He practiced in Oakland from about 1903 to 1924 and thereafter in Honolulu, where he is considered to have created a distinctive Hawaiian style of architecture. His numerous major Oakland works include the Claremont Hotel (1907), the 15-story Oakland Bank of Savings at 1200 Broadway (1907; one of Oakland’s first skyscrapers), Kahn’s Department Store (1913), and University High School (1922). MIT-trained John Donovan (1877-1949) came west in 1911 as supervising architect for Oakland City Hall, representing the New York firm of Palmer & Hornbostel. He stayed to become Oakland City Architect, supervising architect for the Oakland Auditorium and Oakland’s $2.6 million school construction program of 1911-19, an authority on school design, and an architectural consultant for the Bay Bridge. To make them happy, so that they will love America, long to become Americans, and read American books, is our task…. Mrs. Eleanor Smith, Americanization teacher of the Garfield School has been a great help to us in bringing about a larger purchase of foreign books and their deposit in the branches, where our timid patrons can see and choose their own books…. This also helps the second generation to respect and obey their parents, and to become richer by the possession of two languages and literatures. In 1966, near the end of the building’s service as a library, the city acknowledged the confusion of the 23rd Avenue Branch not being on 23rd Avenue, and renamed it Ina Coolbrith Branch, for Oakland’s first City Librarian. By 1973 it had become the Latin American Branch, and last appears in directories as a library in 1976, though building permits from 1980 (for electrical work and fire repairs) still refer to it as Miller Library. It has been used as a nursery school and for other school district uses, as city council district offices, and by Volunteers of America – the current occupants – for social services and job training. It is an Oakland City Landmark, designated November 4, 1980, in a group designation of the city’s four Carnegie branch libraries. Many Oakland residents watched with envy in the past few months as Berkeley’s city council began to explore divesting from Wells Fargo and moving the city’s money and banking services to a smaller, more community-oriented bank. Peralta Community College District has also begun making moves to divest from large banks. San Jose, San Francisco, and Los Angeles have also taken steps in recent years to encourage responsible banking practices by banks which do business with those cities. The City’s existing banking services contract with Wells Fargo expires on December 31, 2012. However, Resolution 82060 authorized the City Administrator to enter into two one-year extensions. This resolution rescinds that authority, and requires that any action to extend must be authorized by the City Council. The role of financial institutions in the foreclosure crisis and recession has created renewed interest in and support for policies to hold banks responsible to the communities they serve. Many jurisdictions in California are now reviewing their banking contracts and considering responsible banking policies. This resolution is to ensure that the City Council has the opportunity to hold its current contractor to responsible banking policies, and that their contract is not automatically extended without Council review and input. The councilmembers, in a separate memo, express concern about the difficulty the city has had in getting information from Wells Fargo and other banks about foreclosures and loan modifications, and frustration that the banks have not done more to prevent foreclosures. Occupy Oakland has fruitfully joined forces with organizations like Causa Justa : Just Cause to use direct action to shut down foreclosure auctions and bring attention to the fraud and illegality behind many—if not most—foreclosures. Pressure from a broad coalition of activist groups, unions and churches has also reignited the city’s effort to renegotiate or end its interest rate swap deal with Goldman Sachs. It seems to me that the city’s negotiations with Wells Fargo—or other banks vying for the contract—may well be another place where strategically-applied pressure from Occupy Oakland and other groups might yield tangible results. There are dozens, perhaps even hundreds, of these crude but adorable little artworks, none of them taller than about 6 inches. They began their occupation a few months ago, but seem to have been reproducing at a rapid rate lately, or maybe I’ve just become more used to looking for them. I noted a few years ago that an unexpected bit of music can brighten a day, if we can shake ourselves out of our stupor enough to listen for it. Street art, at its best, can make us stop short with a childlike delight that the familiar world contains something fresh and new. 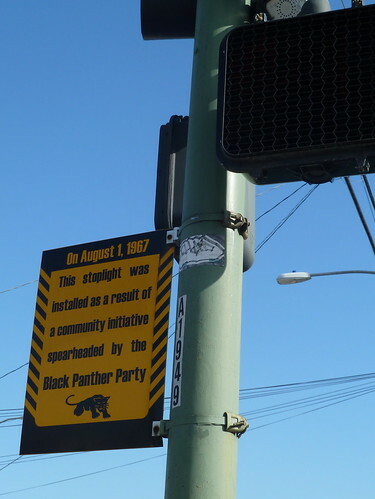 I have no idea whose brainchild these are, but people interested in seeing them can find them lining various streets east of Lake Merritt, on the low hills between East 18th Street and MacArthur Boulevard. There may well be others farther afield, but the neighborhoods between Park Blvd and the lake happen to be where I do most of my walking. I could list some of the specific streets where these fellows reside, but that would spoil it; a lot of the fun is in the finding. I originally set out to photograph every gnome I came upon, but soon gave up on that goal when I realized how many there were. I collected these and a handful of other photos in an album on Google+. I am a 9-year resident of City Council District 2. I am writing to express my deep concern over the actions of the Oakland Police Department toward Occupy Oakland protesters, and my disappointment at your apparent inability—or unwillingness—to demand any accountability from a police force which systematically fails to comply with its own policies. This letter, however, is about something which you actually have authority over: the Oakland Police Department. Some instances of police excess have been so widely publicized that I hardly feel the need to mention them here, but in case you need two examples, please review the footage of an OPD officer breaking from his skirmish line in order to beat Kayvan Sabehgi with his baton in early November, while other officers forcefully block a videographer from capturing the assault on film. Or review the footage Scott Campbell took of his own shooting by an OPD officer the same night. I have seen video of you, Mayor Quan, and you, Councilmember Kaplan, being far more aggressive toward a police skirmish line during the Oscar Grant protests than either of those two men were, and indeed more aggressive toward the skirmish line than 99% of Occupy protesters have ever been. Should OPD have teargassed, beaten, or shot you with rubber bullets on that occasion? Or consider last Saturday‘s events. YouTube is awash with video of OPD beating nonviolent protesters indiscriminately (clear violations of OPD policy), but I‘ll focus on two incidents which suggest that violations are not isolated cases occurring in the heat of tense moments, but systematic failures of command and flagrant disrespect for departmental policies. Police trapped a large group of marchers in the park at 19th and William Streets (right where the statues of Martin Luther King, Rosa Parks and others were erected last year). OPD gave orders to disperse, but blocked every possible path out of the area, leaving protesters to frantically move from police line to police line with no way to leave. Then police teargassed the understandably agitated crowd. A remarkable 8-minute video from a neighboring apartment captured the entire scene, and many protesters have compelling video footage of their own. There appears to have been, at the very least, a breakdown of communication and organization on the part of OPD, resulting in hundreds of innocent people being teargassed because they were unable to disperse while being ordered to do so. After protesters finally did disperse by flattening a fence and crossing the vacant lot at 19th and Telegraph, some of them went home, others kept marching, and some new people joined the protest. After a looping path up Telegraph and down Broadway, protesters were again trapped by police on Broadway in front of the YMCA. This time, OPD did not even bother giving a dispersal order (or if they did give one, NO protesters or journalists on the scene seem to have heard it). Instead, they placed the entire crowd of more than 300 under arrest, in violation of OPD policy which requires an unlawful assembly to be declared at each new location, with peaceful protesters being given an opportunity to leave before being placed under arrest. Also in clear violation of department policy and showing frightening disdain for the constitutionally guaranteed freedom of the press, six professional journalists (including Susie Cagle, who had been wrongly arrested and jailed by OPD in early November) were arrested and held for varying periods of time in plastic handcuffs even though they clearly identified themselves as journalists. Two of the journalists were transported to Santa Rita jail along with protesters, where one was held for several hours and another was held overnight. These are just two incidents in a long day of protest and confrontation. I encourage you to spend an hour or two perusing videos of protesters being beaten, shot with non-lethal “beanbags“ (how quaint that sounds! ), or teargassed, and consider whether that level of sustained violence was needed to prevent an overwhelmingly peaceful crowd from gaining entry to a well-defended building, and to deal with a small number of agitators throwing objects at the helmeted police. I am not surprised that the Alameda County DA is currently only charging a dozen of the 400 or so people arrested on Saturday. Nor will I be surprised if the city ends up paying many millions of dollars to settle a class action suit brought by people swept up in the mass arrests at the YMCA. It did not escape my notice that Howard Jordan’s position as police chief was made permanent today, four days after the department he commands showed itself to be unable, or unwilling, to follow its own crowd control and use-of-force policies. Almost four months after Chief Jordan was made interim chief, OPD is closer than ever to being ordered into Federal receivership because of failure to meet the basic professional and procedural standards required by the Negotiated Settlement Agreement it signed 9 years ago. We are frequently told that incidents are “under investigation” by the department itself or by an independent commission, but removing “interim” from the Police Chief’s title four days after Saturday’s events tells me everything I need to know about how seriously Oakland officials take accountability for the police department. I am astounded that more than three months after Scott Olsen suffered a traumatic brain injury as citizens of Oakland were indiscriminately assaulted by police, no police brass or top city officials have been held accountable by getting fired or being asked to resign. When pressed, many elected officials concede that mistakes have been made, but the conversation is quickly redirected toward disrespectful, disruptive, or destructive protesters who broke a window or threw a bottle or burned an American flag. One has to wonder: do you hold the city’s professionally trained police officers, who are sworn to uphold the laws and constitution, to a lower standard of behavior than you demand from a disorganized bunch of protesters? It certainly seems that way. As I said above, I am not writing in order to defend the behavior of Occupy Oakland, some of which I strongly disapprove of. And my personal interactions with individual OPD officers have always been professional; I have little reason to doubt that most are decent men and women just trying to do their jobs. It distresses me that so many Oakland residents see the police as their enemy, and I appreciate the steps OPD has taken in recent years to be more open and accountable to residents. That said, the brazen disrespect for policies, laws, and the constitution shown by some officers sworn to uphold them is disturbing evidence that deep systemic problems remain, and the absence of leadership on this issue from top OPD and city officials is truly dismaying. I appreciate your time and attention. I will also be posting this letter online as an open letter. Feel free to contact me if you would like to discuss any of this further. Packer: What affect is Occupy Wall Street having in Washington, if any? Frank: Well that’s just, I’m sorry, I know I get accused of being rude, but that’s just stupid. What do you mean, it either worked or didn’t work? Have we had no gains? No elections have ever been won? Nothing good has ever happened? That’s simply not true, it’s more or less that it didn’t work. And by the way, what works better, standing in a park? How does that help? So what you’re telling me, their answer is, “Well, we’re not going to try to influence the political process. We’re not going to try to elect people who agree with us. We’re not going to try to get the people who are in office to adopt good public policies.” Well, that’s a confection of defeat. If you announce that you are not going to participate in the political process, then when you ask what impact it’s having on the Congress, I guess the answer is obvious. You know, in general I would think that if you are a vegetarian and you write an essay about what you like to eat, very few butchers are going to read it. I don’t entirely agree with him—I think “standing in a park” has actually been a fairly fruitful tactic in these early weeks and months of the movement—but I think he’s right that if OWS determinedly remains outside the conventional political process, it will not end up amounting to anything more than a marginalized, interesting historical curiosity. 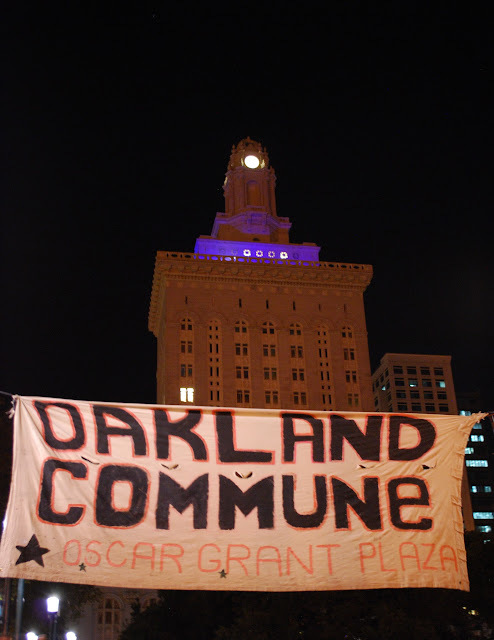 The “Oakland Commune” banner flies above Occupy Oakland again. If you’ve read some of my old posts here, then you may have noticed that the only things which can cause me to swoon or to find religion are bike lanes. So it may not come as a shock that a bike lane is what has roused me from my blogging slumber. 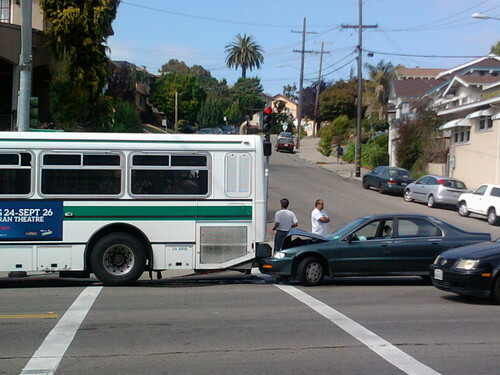 I commute back and forth to Alameda by bike several times a week, and in late August, I was almost crushed by an SUV when it drifted into the bike lane (which is to say, drifted into me) rounding the curve on Kennedy Street as we approached the Park Street bridge. It’s not unusual to see automobiles take the curve too tightly and cross into the bike lane on that street, but usually drivers have the decency, and the awareness, to avoid doing it when a bicyclist is actually in the lane. Luckily, I was more alert than the driver, and was able to slow down to avoid getting knocked over as the SUV quickly transformed a 5-foot bike lane into a 4-foot, then 3-foot, then 2-foot, then 18-inch bike lane (at which point my shouts of “What are you doing?! Bike Lane! 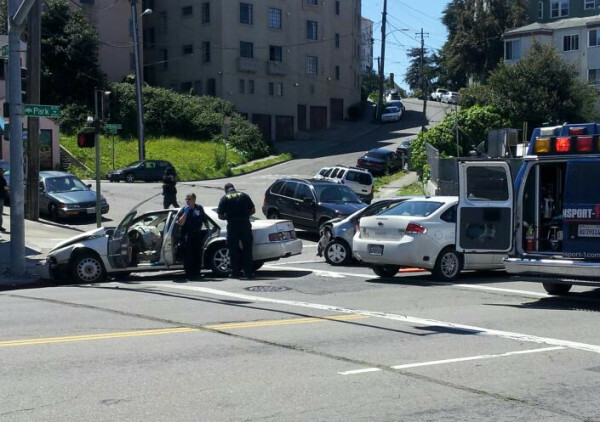 !” may have finally penetrated the thick shell of the SUV and the even thicker skull of the driver, who drifted back out of the bike lane and continued on her oblivious way). All’s well that ends well, and as auto/bike conflicts go, this one was minor, but it reminded me of why some cyclists argue that old-fashioned, unseparated bike lanes like the ones on Kennedy Street are worse than having no bike lane at all: bike lanes created by simply striping off a 5-foot section of the roadway can give riders a false sense of security, without actually giving us any actual protection from plentiful hazards such as spaced-out drivers, illegally-parked cars, or opening car doors. Bike lanes may also implicitly give drivers permission to be oblivious or hostile to cyclists on streets without bike lanes, by unintentionally sending the message that bikes do not belong on the same roadways as other vehicles. 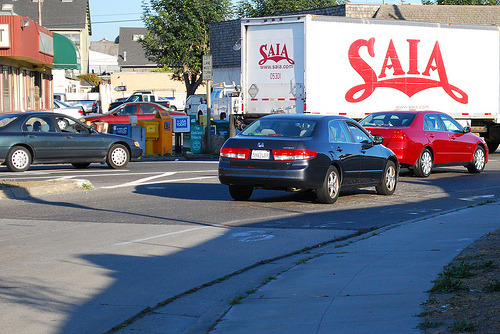 Those are debates for another day—personally, I prefer the inadequate, dangerous bike lanes which are prevalent in Oakland to not having any bike lanes at all. The bike lanes on Kennedy Street, however, were poor even by Oakland standards—some of the paint striping was so faded that one couldn’t see it at all, and the painted markings designating the shoulder as a bike lane were so worn away that the words “bike lane” were only legible if you already knew what it said and the icon of a bicyclist looked more like a unicyclist. 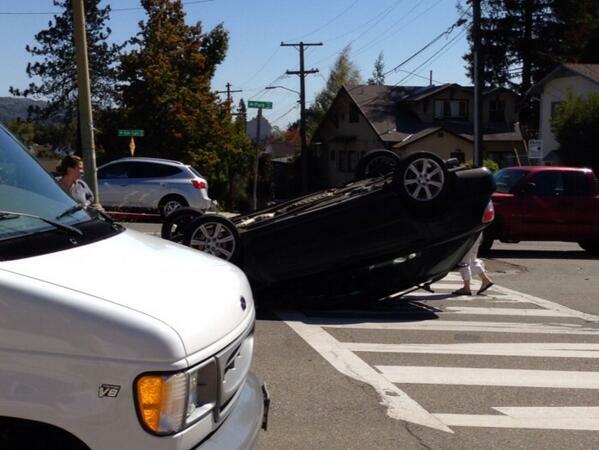 It’s no wonder that many drivers drifted into the bike lane as they rounded that curve! Kennedy Street bears a lot of the traffic heading from Oakland to Alameda, and is heavily used by trucks serving the nearby industrial areas. Kennedy Street also abuts two cement plants, so a lot of sand granules end up on that stretch of road, grinding away the paint as cars and trucks roll by. Combine those problems with the fact that the Kennedy Street bike lane has been around for years, and you have a recipe for a very degraded bike lane. Given that the Park Street bridge is one of the main access points for cyclists going to and from Alameda, Kennedy Street gets a lot of bike traffic, so the faded bike lanes going around the curves on Kennedy Street seemed particularly worrisome. After my irritation with the SUV’s driver had subsided somewhat, I decided that instead of, say, slashing the SUV’s tires or firebombing an auto dealership, a more fruitful way to channel my anger might be trying to get the bike lanes repainted. That night I went to Oakland’s Department of Public Works website and reported the degraded bike lanes as an “Unsafe Condition.” I really had no idea whether anything would be done—while I did believe that the condition of the bike lanes on Kennedy Street created a hazardous condition with potentially fatal consequences, there are dangerous street conditions all over Oakland (potholes, etc.) and new bike lanes being added every year, so I wasn’t sure that re-striping an existing bike lane would be deemed a priority. 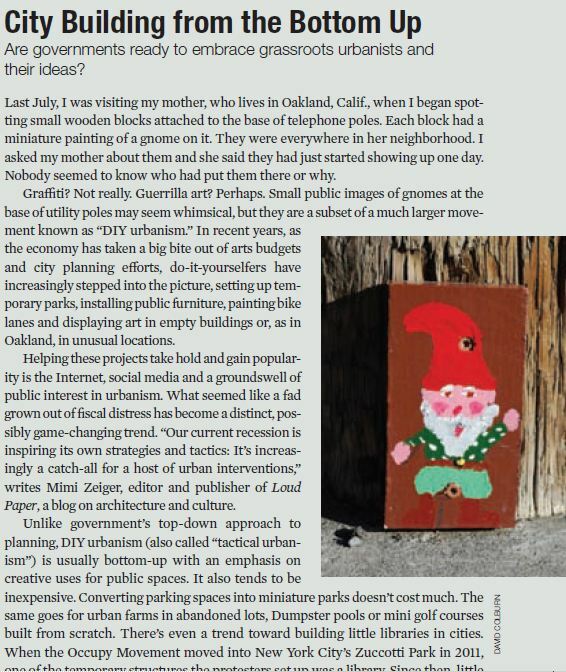 It’s easy to become cynical about Oakland’s municipal services, since it sometimes seems that all one hears are rants about lazy, unhelpful, or incompetent (or worse!) city employees. And to be sure, many people have complained of ineffectual responses when they’ve reported problems to the Public Works Department, but the two times I have reported specific problems (the bike lane striping and a burnt couch which was blighting 12th Avenue early last year), the city has responded with alacrity. It’s nice to know that even with layoffs and furlough days and all its other problems, the city can still get some stuff right, at least some of the time. 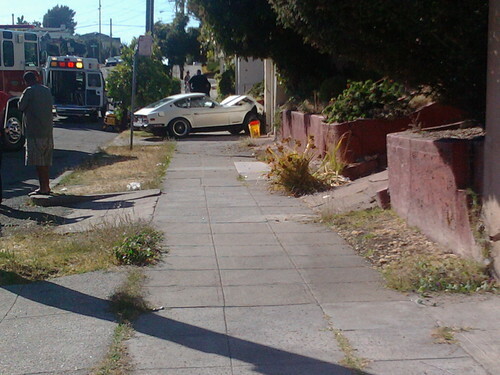 Safer Streets By Any Means Necessary?